COURTNEY MONTGOMERY, Miss Spokane Interstate Rodeo was crowned in January 2015. Courtney immediately made her appearance everywhere. She traveled to Grand Coulee, Newport, Cheney… just to mention a few. Courtney’s favorite events have been the local events to include the Lilac Festival Royality Luncheon and the Spokane Indians Pitch For The Cure Game. So much more for her to do. Courtney will be at the SPOKANE RODEO in September, the PRCA. 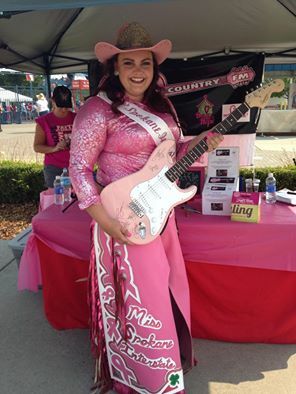 Come visit our “BECAUSE THERE IS HOPE BOOTH” and enter to win this PINK Guitar signed by VINCE GILL.